“We grow green leafy vegetables as it has a stable market throughout the year. It also gives quick returns as almost all green veggies are one month crop. Selling veggies is easy because we have the market nearby and I have good customer base, they come to the farm for buying greens directly from us. We grow minimum 4-6 varieties of greens in 0.5acre. We plan the plantation in a way that green crops are grown in alliance with winter, summer, pre-monsoon and post monsoon. For example dill leaves are sensitive to disease attack (budi roga)(ash disease) so it is not cultivated during mist formation. We have learnt all these farming intricacies with experience in farming for last 20 years. 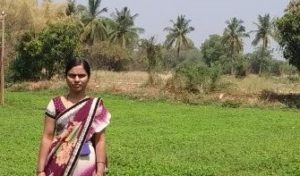 This knowledge is beyond the books and google,” affirms Mrs. Gangavva Avaradhi, progressive farmer from Gamanagatti village, Dharwad district, Karnataka. Green leafy vegetables grown are fenugreek, coriander leaves, dill, spinach, mint, rajagiri etc and vegetables namely radish, tomatoes and onions. All these crops are grown as intercrop between mango and chickoo trees. Mint leaves are cultivated on separate portion as it yields for 3 years once planted. “After 3 years we remove it and grow mint on other land as crop rotation is important. Post harvesting mint three years later in the same land we grow some other vegetables after treating the soil with cattle manure. In this way the cycle keeps repeating. 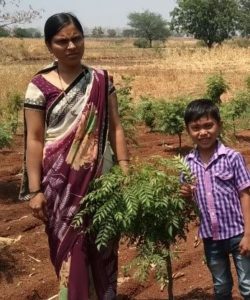 We will try to control disease with good pest management,” highlights Mrs. Gangavva. Speaking about seeds to crop production yield, she elucidates, “Seeds sown in the farmland depends on the weight of the seed like radish seeds are heavy but spinach seeds are light. However on an average we harvest 1-2 ton greens from approximately 1quintal seeds. Our harvest also depends on the climate and environment. We can say that we get some amount after deducting the production cost and are happy that we are not dependent on any one crop financially.” 50% of the produce is sold to the walk-in buyers where as rest is sold in the market. Price of the vegetables is decided as per the market price. “It is the only discouraging factor of farming. We do not get any premium price for our produce even though we have organic certification. The market price is same for all the produce whether organic or chemical produce. Only benefit is that as we are organic our production cost is less because we do not buy any expensive chemical fertilizers or pesticides. So whatever we earn is our profit. 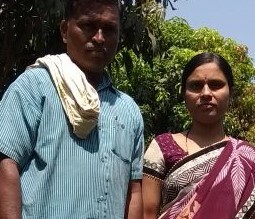 Further I am satisfied as we grow organic and eat organic thereby our health and our soil health is maintained,” asserts Mrs. Gangavva. Greens sell all through the year. “As per my experience I feel summer is the best time to grow greens as demand is more and supply is less so price is high. During monsoon the supply is more as many farmers grows greens thus price comes down,” she states. Mrs. Gangavva also has mango and Chickoo trees in her farm. The varieties grown are Ratnagiri and Alphanso while chickoo is cricket ball variety. “In our region we are having poor demand of chickoo as people do not prefer the fruit due to its high sugar content. Mango fruit is good but the price drops as supply is increasing every day. To cope with this problem we have now transplanted moringa saplings,” she shares. 600 moringa saplings are transplanted in 5 X 5 feet distance in 10guntas. In the same field greens and vegetables are cultivated as intercrop. These veggies are harvested 4 times in a year. “Moringa is a bonus crop as we neither spend any money nor much time on cultivation. There is no need for manure because moringa saplings fulfill its manure requirement from greens and vegetable cultivation,” she says.